In a recent post, I described how we're preparing our kiddo #4 for this new educational environment. 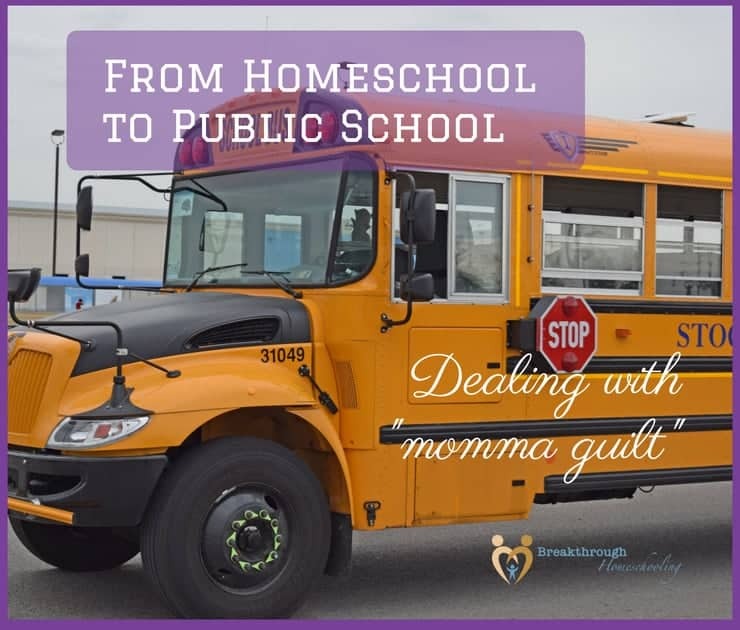 In today's post, I'm addressing the issues that I - as a homeschooling mom - had to face (and continue to do so) as our teen transitions from homeschool to public school. Let me preface things by saying if you're tempted to "skip" reading this post because you're planning on "never" stopping homeschooling, or you can't even imagine any other lifestyle...just be careful. None of us really know what the day will bring...what situation or event will bring along a drastic change in your well-intentioned plans...how the end of our journey will play out. As you may have read in other places on this blog, when our family first started homeschooling some two decades ago, we only anticipated doing so for a few years. At the time, we were living in an area that had, well, let's just say, not the best education system, but we thought we'd only be there for a short while. Making the decision to send our last kiddo to public school was not easy, nor one taken lightly. Of course, as often happens with our plans, God saw fit to do otherwise, and we not only stayed put in that community but also began to adopt homeschooling as a cherished lifestyle. So after graduating our two eldest kiddos, we naturally assumed that the three others would follow suit. Before graduating kiddo #4 this past year, however, a few things happened in our family that caused us to rethink things... The major event was an out-of-State job offer my husband accepted that necessitated a family move 5+ hours away from what had become our hometown. Quite frankly: this has been the hardest thing I've ever done. Yup, even harder than the decision TO homeschool...even harder than the decision to homeschool high school! I've begun to realize that after doing this so long, I have truly begun to identify myself, first and foremost, as a "homeschooling mom." I'm a Christian, a wife, a sister, daughter, friend, writer, blogger, and more. I have many other interests and abilities, too, which I enjoyed uncovering at my husband's encouragement and help. But primarily when I think of who I am, or answer the questions "So, do you work?" or "What do you do?" the first thing that comes to mind is "I'm a homeschooling mom." But now - moving away from friends, away from my church family, from what had become home and is familiar, and then laying down my identity as a homeschooling mom - well, all this has definitely brought me to the end of myself. Which is, after all, where God wanted me in the first place! Sign up - - > to become one of the homeschooling mommas getting weekly (more or less) encouragement from my "Top of the Week Breakthrough" and get instant access to a bunch of tools to help you as you navigate teaching your teen during this time. Coming soon to subscribers: my breakthrough resource "Making the Top 5 Fears of Hs'ing High School Work for You!" It's taken me quite a bit to even be able to write about this. For one, it took me a while to come to this realization; then even more time to acknowledge or accept it. Additionally, I really didn't want to talk about this in earshot of kiddo #5, because I don't want her to feel in any way, shape, or form, badly for the step she's taking. Truly, at the end of the day, I'm confident in her abilities to excel no matter what the learning environment she finds herself in; and certainly, over the years she'll find herself in many different ones. I just didn't think that this season (of my life) would pass by so quickly. In true homeschool-fashion, of course, and realizing I'm not the only one to come to the end of my homeschool journey, I've pulled together the steps and materials I've used to prepare for and now work through this stage. (Ya see, I knew it was coming at some point!) It's my desire and mission, as always, to encourage and inspire other homeschool moms, even as they're preparing to "wrap things up". Our reasons may differ, our situations may, too, but no matter what, we all have to find a way to move forward. If you're going through something similar, or know someone who is, please consider taking a look at this mini-course I put together "Is there life after homeschool? Preparing for the Empty Nest". This reality is coming to us all...here's hoping you're a tad better prepared for it than I was! Use the code "LifeAfterHS" for a 25% discount on the course, valid through September 1, 2018. I know I'm not the only mom in the history of homeschooling to experience this. (And I also know that many parents even plan on enrolling their teens into a more traditional setting upon arriving at the high school years.) But for those for whom this turn of events may have come from left field, out of the blue, and just way-too-soon...take comfort: God's got this. A few of my fellow blogging friends have written some wise words of advice of their own. I'm sharing them with you here, along with a few other practical resources I've found, because reading them has helped me through this season. I hope and trust they may be words that will comfort and encourage you, too.